Who does the housework? | Why so angry? »anger management»Who does the housework? Apparently who does the housework can depend on what class you belong to. 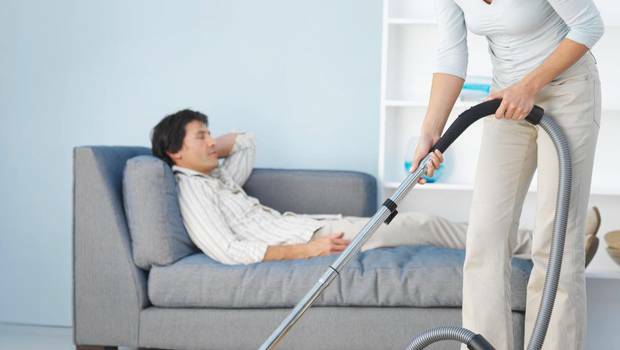 Lower class males don’t like housework as it offends their masculinity. Middle males don’t have that attitude. Husbands fined it harder to do the work more than common law relationships. It would seem every study produces contradictory results. What we do know in anger management is that men don’t notice dirt as much as women do and therefore think it unimportant. That doing housework has historically been “women’s work”. However the world is changing. Arguments occur when one side believes the rules are not right. For the man not doing housework can naturally seem right, yet if she doesn’t agree what is going to happen? To put it mildly she will be pissed off. She may complain or nag and make his life miserable. She may put up with it, but somewhere along the line there will be consequences. Messiness stands out for a woman. She reacts as if she has been wounded, she is emotionally upset and that will not subside until the mess is cleaned up. It is difficult for men to understand this. However for domestic survival requires being smart in seeing what makes a woman happy. Making her wrong or ignoring what is important for her makes her feel she is uncared for and unloved. At some point she may react far too strongly as a result of these unacknowledged frustrations hitting the tipping point. would seem every study produces contradictory results. What we do know in anger management is that men don’t notice dirt as much as women do and therefore think it unimportant. That doing housework has historically been “women’s work”. However the world is changing. Arguments occur when one side believes the rules are not right. For the man not doing housework can naturally seem right, yet if she doesn’t agree what is going to happen? To put it mildly she will be pissed off. She may complain or nag and make his life miserable. She may put up with it, but somewhere along the line there will be consequences.